Let me post a high time frame chart of the ES that I have posted a few days ago. If you look at it carefully you will see that we had 3 waves down in the (1A) leg (black label) then an overlapped 5 waves up for wave (2B) and we currently have 3 waves down in the (3C) leg this could be a very huge ABC and become a B wave labeled [2B] (green label). The alternate bearish count is that we are now in wave 3 of 3 but 3 has already 5 waves down as per the 15 min charts posted earlier, so if we don't go do very soon we may see the bull scenario instead. Anyway that was one of the reason why I was a buyer at the low this morning. 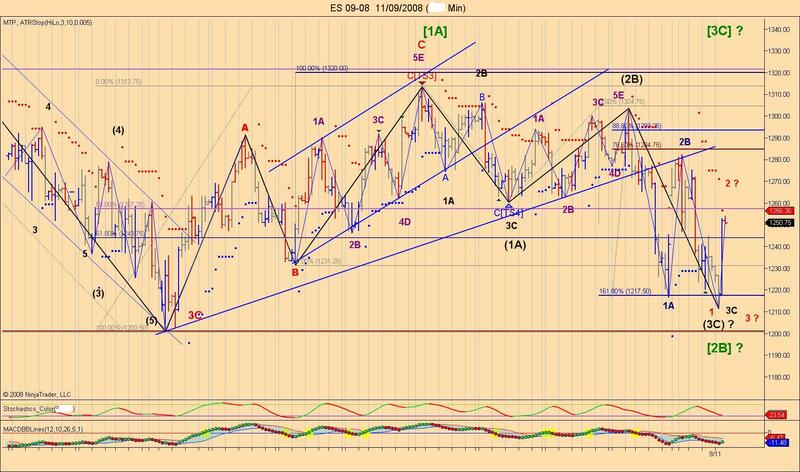 We will now have to wait and see how the market unfold and I will have to check my TTT book to see what we can expect. It looks like things are setting up for a "Buy Day Low Violation". Today is a "Sell Day" and the market is currently below yesterday's lows. If it remains so until the opening I think I might expect a failed rally and then being looking for shorts to the Buy Day Low Violation avg of 1208.66. After that maybe? it will start setting up for a rally so we have a chance of getting a positive 3 Day Rally??? So far we made it to positive rally mode for the sell day but we will need to stay or get back above 1221.50 sometime tomorrow to get a 3 day positive rally. If today was your 1st day of thinking of trading in 1st the 1/2 hour, you may have picked a tuff one due to rollover day. but yes there was good trades to be had if you like the wild swings. Does anyone know how to make forum fit the screen so I don't have to keep scrolling? 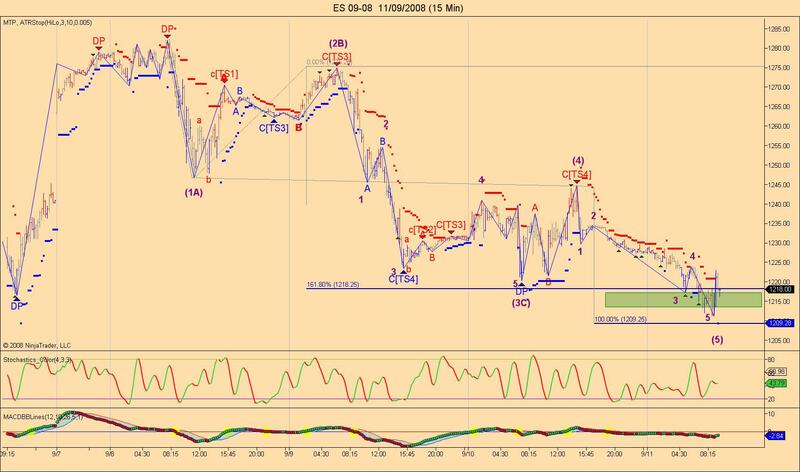 Here is the ES 15 min updated chart that I posted this morning. Any low lower then this wave 5 would imply that we would start an extension down in this wave 3 as the big 5 waves labeled (1) to 5 are the waves in the C leg on the big time frame chart that I previously posted. there is no way to do this as of yet. I mentioned it to the owner of the site and he said he is working on it. If the chart pic would be smaller, it might make the forum fit the screen. I think it's because there is already a big picture on this page... it will size to fit the biggest picture it needs to show. I hope some of you had the chance to go long earlier this morning based on my 15 min wave counts and the TTT expected low in the ES. We are 40 min int the trading session and the gap has not closed so we may have TVGR in effect and a Buy Low Violation, looks pretty bearish. I'm looking for shorts only now! Ze market iz not following miz plan, and itz muzt be punished!